Hotel Victor is located in the vast archaeological zone of the Old Appian Way. The tomb of Cecilia Metella, the St. Sebastian Basilica, the Catacombs of Calixtus and the Temple of Romulus are just a few of the outstanding sites in this area rich in history. The race track of Le Capannelle and several sports facilities, where guests may enjoy a game of golf or tennis, are located nearby. Guests who are travelling by car have easy access to the ringroad Grande Raccordo Anulare and the airports of Ciampino and Fiumicino. The city centre is easily reached by way of the underground line A which in a few short minutes link you to the Termini rail station, the underground line B, St. Peter's Basilica, The Colosseum, Circus Maximus and San Giovanni. In the heart of Roma Antica, not far from the major monuments and antique Roman palaces (Fontana di Trevi, Colosseo,Piazza di Spagna, Quirinale, Palazzo Venezia, Teatro dell'Opera). The hotel is also in the vicinity of 'Termini' train station,Air Terminal,subway and the main city bus routes.A plain and worn slumbermill hotel, quiet, safe and run with a smile. Golden Tulip Bellambriana is a new 4 star hotel built in modern style and offers 91 elegant rooms, including 4 suites, 18 Deluxe and disabled rooms. All rooms are equipped with LCD flat TV, radio channel, ADSL line, king size beds, mini bar, trouser-press, bathroom with basin/shower, hairdryer and superior courtesy line. Our guests will find an exquisite variety of fine food, typical Mediterranean kitchen at the restaurant "Terra Mia" in an elegant and comfortable atmosphere to ensure a memorable dining. Our business guests can arrange their meetings in our conference centre with 3 meeting rooms welcoming up to 150 people. All meeting rooms are equipped with the most modern technologies. Hotel also offers a gym, sauna and Jacuzzi. Private car park in front of the hotel is free of charge or private garage at charge. The Hilton Garden Inn Rome Airport is located on the Rome Fiumicino Airport platform (Leonardo da Vinci Airport) in front of Cargo City and within immediate reach of all the major attractions of Rome. Stay at the Holiday Inn Rome-EUR Parco dei Medici hotel for a handy location in the EUR business district and proximity to Rome Fiumicino Airport. Enjoy the convenience of Holiday Inn Rome-EUR Parco dei Medici , next to the city's business hub and 12km from L. Da Vinci-Fiumicino International Airport . You can reach the hotel via our airport shuttle free of charge. Enjoy also our shuttle services to/from city center, Fiera di Roma and to the airport at â 2,50 per person-one way. Holiday Inn Rome-EUR Parco dei Medici is neighboured by major companies, including WIND Telecom and Telecom Italia. You can reach the Palazzo dei Congressi within minutes, or welcome large groups to our 18 meeting rooms which can accommodate 800 guests. Wireless Internet throughout the hotel helps keep you in touch. The iconic sights of Rome are a short drive from the hotel. Catch a ride on the hotel's shuttle bus and within minutes you can be admiring the Spanish Steps or the museums of the Vatican City . Nearby entertainment comes in the form of the multiplex The Space Cinema. Start your day the right way at Holiday Inn Rome-EUR Parco dei Medici . Enjoy the extensive breakfast buffet at our La Serra restaurant before planning your day over a cappuccino. In warmer months, wake up with a few lengths in the outdoor swimming pools . La Serra welcomes you back for dinner before cocktails at Incontro Lounge. 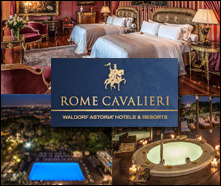 It's just a short walk from the terminal to the Hilton Rome Airport hotel via moving walkway and Rome the Eternal City is 30 minutes away by free shuttle. Work in the business center and 21 meeting rooms with wireless internet access book the congress center or unwind in the Executive Lounge. The Isa is a Refined Design Hotel located between the Vatican and the Spanish steps, just a short walk from Castel Sant?Angelo and many other historical monuments. Every morning a rich breakfast is served on the terrace where you can enjoy a fantastic view of the San Peter? dome. Welcome to the Express by Holiday Inn Rome - San Giovanni!The hotel is located in a very convenient position, with railway station 'Rome Tuscolana' within 300 metres serving International Fiumicino Airport, and subway stop 'Pontelungo' within 500 meters. Our staff caters to the needs and specifications of the guests to ensure that they have an enjoyable stay.Hospitality, warm colours for a warm welcome, and suitable spaces merge together to offer brightness and comfort to our guests.The Express by Holiday Inn Rome-San Giovanni has 120 air-conditioned and soundproofed rooms, some with balcony, are all equipped with Satellite TV, WI-FI access, pay tv, modem connection, hairdryer, tea and coffee making facilities.Wi-Fi High Speed internet access is available in all our rooms and in all our public areas, including our inner court. Our special breakfast offers a large selections of items with creative daily and weekly proposals.Our biggest satisfaction will be to maintain the hospitality promise: to let you have a pleasant and unforgettable stay.